On 23.09.2012, the Ghana U-20 national football team recorded a 4-1 victory over Morocco U-20 in a qualifier for the 2013 African Youth Championship. One of the stars of the evening was playmaker Moses Odjer of Tema Youth FC, arguably one of the finest talents in Ghanaian football. In 2010-2011, Odjer was playing in the Division One League, the second level of Ghanaian football. Odjer was a key player when Tema Youth FC won promotion to the GLO Premier League 2011-2012. On 09.10.2011, Odjer made his top level debut. On 11.01.2012, he scored his first ever top level goal. It did not take long before Odjer caught the eye of the various national football teams of Ghana. In January 2012, Odjer was picked in a training squad for the Ghana B national football team. Odjer had a wonderful season, playing approximately 25 matches and scoring two goals. Odjer formed an impressive central midfield duo with the tireless Derrick Mensah. Tema Youth FC finished the season as number 11 of 16 clubs, not bad for a newly promoted side with several young, inexperienced players. Odjer’s brother, Nicholas Odjer, is a striker at the same club. After the season, Odjer was linked to top club Hearts of Oak SC. During the summer of 2012, Odjer started training with the Ghana U-20 national football team. 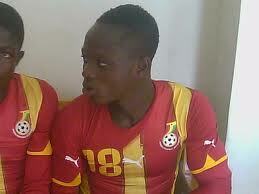 On 11.08.2012, Odjer scored for Ghana U-20 against Uganda U-20 in a qualifier for the 2013 African Youth Championship. A few days later, MTN Football wrote that Odjer was picked in the squad for the Ghana U-17 national football team. To be honest, I have no idea what Odjer’s correct birthyear is. In any case, Odjer is obviously still a teenager. I have seen Odjer play several times. He is a classical playmaker and controls the flow of Tema Youth’s offensive play. He is often involved in passing moves which lead to goals. Odjer is a highly technical player with good vision, shooting, passing and dribbling ability. He works hard and plays with smartness rarely found in teenage midfielders at this level. Odjer can also play is a deeper role and as a holding midfielder. Odjer is not the tallest of players. According to Scouting Team, Odjer is 173 centimeters which I believe is correct. Moses Odjer is a player with tremendous potential who should be followed closely during the up-coming season. The picture was found on sportsinghana.com.